Their work is transforming the way we treat - and now even cure - patients with a wide range of once-devastating diseases. And these visionaries are only getting started. All across the country today, there is work being done in labs that, if successful, will benefit patients and society for generations to come. Biotechnology's strong track record can be traced directly to the men and women working in the field. For them, biotechnology is not just an occupation; it is a mission and a calling to solve the greatest challenges of our time: To unlock the essence of life itself and to use what they learn to treat and cure disease. These individuals are entrepreneurial. They are risk takers. They are driven by science and are stubborn in their refusal to accept human suffering or the status quo. 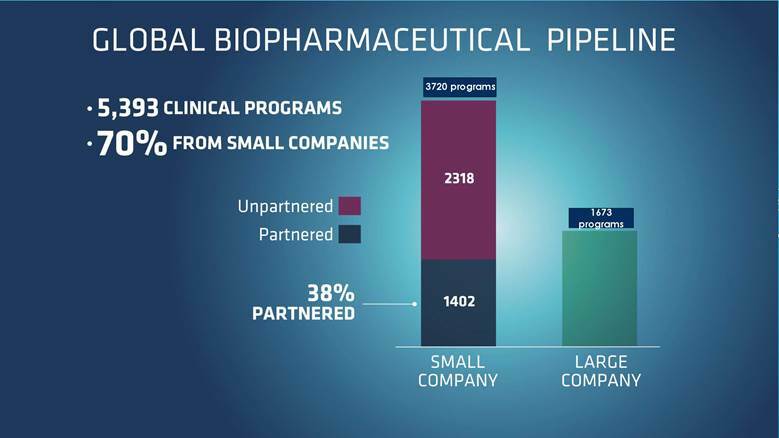 Their passion and perseverance is why about 70 percent of the biopharmaceutical industry's clinical pipeline is attributed to small companies. The vast majority of the companies working on groundbreaking medical innovations in biotechnology are small, pre-revenue enterprises. Their success in getting new cures and therapies across the finish line rests on one key factor: the ability to attract the enormous amounts of private capital required to fund these challenging and incredibly risky endeavors. To learn more about the impact of biotechnology on patients and society, as well as the factors needed to keep the innovation engine running strong, go to www.innovationsaves.life. And to get recent materials about innovation and the healthcare ecosystem, go to https://www.bio.org/4BIO. There also is drugcostfacts.org, a one-stop shop for factual information and answers to some of the most hotly debated questions regarding the role of prescription drugs in our nation's health care system. You also can visit BIO Action, a new on-line advocacy tool that allows you to contact your federal, state or local elected officials to share your views via e-mail or social media.